Highly efficient one-for-one replacement for conventional industrial luminaires – and with a higher efficacy than its predecessors, it promises a quicker payback than ever. With two sizes and six lumen outputs ranging up to 35 000 lm, the third generation of HiPak is an ideal option for point-for-point replacements on retrofit projects. With wide (WD) and rack (RK) light distributions available, and specially designed reflectors, HiPak is also suitable for applications such as retail, where appearance and visual comfort are high priorities. HiPak enables greater energy savings through DALI versions, and motion and daylight sensor integration. An emergency option is also available. All luminaires are suitable for single point suspension. All wide optic luminaires (WD) are supplied with a mounting hook as standard (chain to be ordered separately: 96502605). For rack optic luminaires (RK) it is recommended to use the fixed rod suspension or surface wall mounting accessory (to be ordered separately). Mounting accessories to be ordered separately: stirrup for wall mounting (96631534 / 96631860), rod suspension for pendant mounting (96642766), wire suspension (96502609) and catenary suspension (96502610). Motion and daylight sensor can also be ordered as accessory (96630823). All luminaires are supplied pre-wired with a quick connector plug. 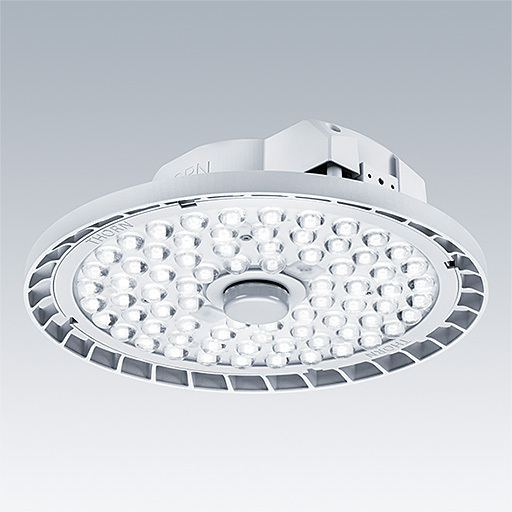 An IP65 single point suspension LED high bay luminaire with plug and play connection for rapid installation. Available in 10000lm, 15000lm, 20000lm, 25000lm, 30000lm, and 35000lm with a choice of rack or wide beam optic. Fixed output (HF) and DALI (HFI-X) available as standard.